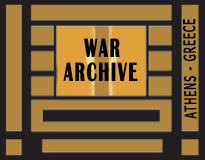 The WAR ARCHIVE houses the private collection of books, magazines, assorted printed matter, documentary videos, photographs, audio material and military models of Andrew Freris and Anabella Levin-Freris. The collection focuses on all aspects of war, but in particular on the Second World War. The aim of the Archive is to offer a combination of materials which helps give a multifaceted and rounded view of war combining text, image, sound and models. The Archive does not aspire to be a research or academic library on war, but a small and specialized source of information. Detailed information on the broad sections of the collection can be found in the appropriate sections of the website of the archive: www.wararchivegr.org. The following paragraphs simply summarize the contents of the collection. Most of the printed matter collection is in English, but there is an extensive section in Greek and a small number of books and magazines in French, German, Spanish and Chinese. The coverage of the WWII is detailed including all fronts: Western, North African and Eastern and the war in the Pacific. There are some books on the WWI and some on other wars (Ancient Greek, Napoleonic, etc.). The wars of modern Greece from 1821 to our days are also covered, especially the Italian-German war and the Civil War. The video collection is possibly the best section of the Archive. It is focused mostly on WWII and contains a unique collection of commercially available documentaries, as well as rare material, a great deal of which is not available to the public commercially or not available at all. The videos have been sourced from across the world. The count of individual video items, as opposed to just individual DVDs, runs into thousands making this, possibly, one of the biggest collections of WWII documentaries in private hands. Nearly all the videos are in DVD format but there are a few in VHS. The videos do not cover just the battles and the fronts, but also the weapons, arms and tactics, personalities, politics and society during the war, as well as military training videos of the time. There is also a very large collection of documentaries focused on the Third Reich and not just only during the war years. There is an extensive collection of documentaries on Greece, also containing rare material, including a unique collection of true color films from Greece from 1934 to 1950. The collection of models covers almost exclusively WWII, the Allies and the Axis forces, including Japan. There are models of all the major tanks and armored vehicles, soldiers and equipment participating in major battles and fronts as well as all the key aircrafts, fighters and bombers. There is an extensive section of models on the uniforms of the Third Reich. Last but not least, there is a continuously growing and unique collection of specially commissioned and professionally filmed interviews with Greek veterans of the WWII and of the Civil War covering all aspects of the troubled history of Greece from 1936 to 1949. Special emphasis was given on material which covered the Metaxas period. The historic importance of these interviews cannot be underestimated as there was no agenda and no questions asked during the interviews. Major participants of key political and military events simply spoke directly to the camera on what they thought was important and on what they wanted to talk about. The Archive is open to all members of the public over the age of 18 who have interest in history. Previous appointment must be made with the personnel of the Archive and no material can be removed or copied in any manner from the collections of the Archive. There are strictly no lending arrangements of any kind. There are reading facilities as well as facilities to watch videos in privacy through headphones. The Archive will be organizing several events, but a key series will involve talks by experts, primarily, but not exclusively, on battles and fronts of the WWII using as illustrations the printed material, showing of appropriate videos and setting up special battle displays using the relevant military models. We are delighted to open this collection to the interested public and to make a modest contribution in understanding the terrifying but important phenomenon of war.